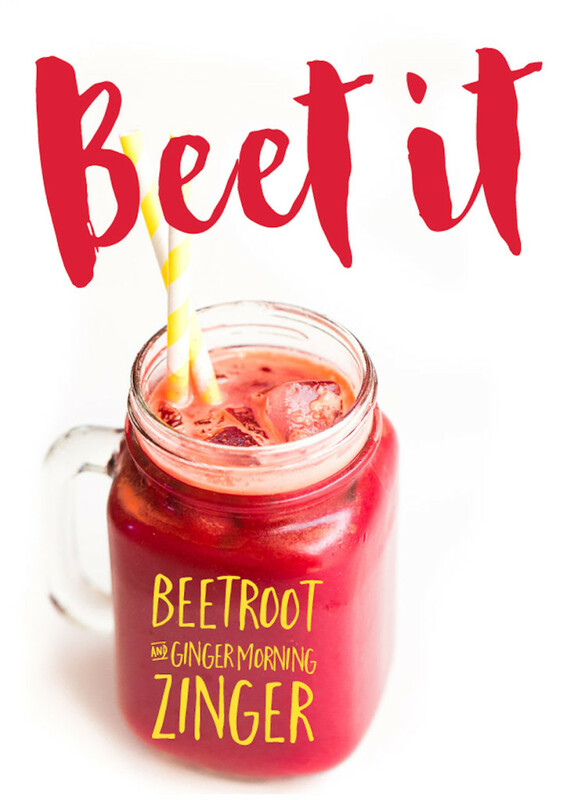 This raw drink has all the yummy goodness of fresh beets with a delightful dash of ginger zing in your mouth! A few pieces of naturally sweet apple make this veggie juice a delish summertime sipper. To turn it into a winter warmer (and put some extra lead in your pencil), just increase the amount of ginger which has spicy, warming properties that will really heat things up. Plus, it’s packed with goodness. Raw, freshly juiced beetroot is all about that iron. And apples add vitamins A and C which are valued for their anti-oxidant powers. Oh yeah. Remember to rinse your ingredients before you start. If you’re using organic produce you don’t really need to worry about peeling the apples, beetroot or ginger. Cut the beetroot and the apples (discarding the core) into pieces just small enough to fit into your juicer. There is absolutely no reason to spend forever chopping them up into tiny pieces, which why making veggie juice is such a quick win. Depending on the size and type of your juicer , you can also simply pop the entire thumb of ginger in, as is! We have been using our masticating juicer for five years now and it works like a charm. Juice the ginger first, followed by the apple so that it flushes out any bits of ginger that may be left behind. Finally push through the beetroot pieces, and you’re done! Serve your freshly prepared beetroot and ginger raw veggie juice immediately and enjoy that sweet and spicy ginger zing in your mouth. Tip: If you’ve been juicing for any time at all, you don’t need us to tell you that the quickest way to keep your juicer clean is to rinse it right away before any bits of pulp harden. But we just thought we’d put it out there anyways! Juice the ginger, followed by the apple and beetroot. Serve immediately and enjoy fresh! « How to Make Vegan Ground Beef in under 30 min! Meat Free.